The Cricut Explore Air 2 might not be the newest Cricut machine out in the market, but none-the-less it is one of my favorites and one of our best selling machines. CURRENT CRICUT SALES! See the current Cricut Promotions and Deals here. 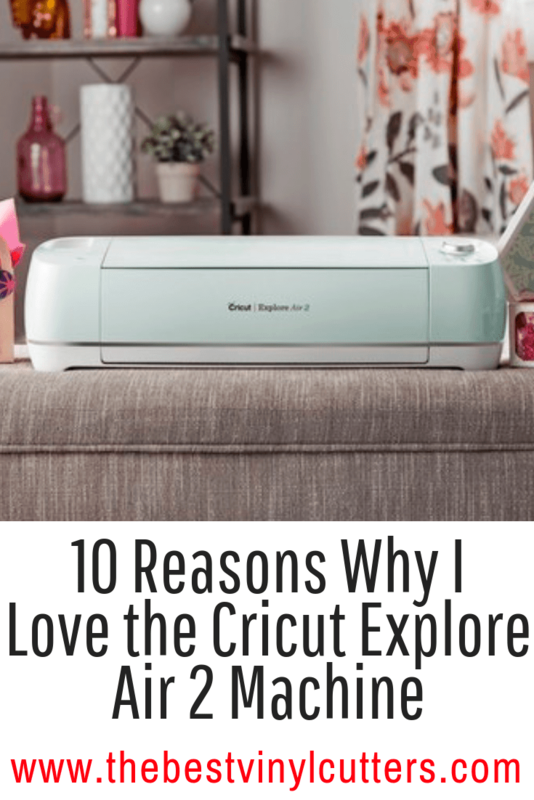 Here are 10 reasons why I still love my Cricut Explore Air 2 cutting machine. 1. It Can Cut over 100+ Materials: We love how versatile the Air 2 cutter truly is. It can slice through over 100 different types of materials. Not bad huh!! Wondering what it can cut? Click here to see the full list. This nifty machine can also use a 3 of the Cricut blades. 2. Free access to Cricut Design Space: The Design Space might not allow you as much creativity as software such as Adobe Illustrator might, but we love it because it is fabulous for beginners. It allows you to do all of your designing in one place (for free)! It also comes with 3,000+ ready-to-make projects and quick cuts. 3. Cricut Image Library: For just $9.99 a month you can have access to over 30,000 cut-ready premium images as well as access to over 400 beautiful fonts. There are many other benefits to becoming an access member, read more about it here. 4. Use your Own Fonts: Yes, on top of grabbing the incredible value deal of the membership, you can also use any other font that you can find online. There are many free SVG files available online. 6. Use your Own JPG, PNG, GIF & SVG Image Files: Yes, just like with the fonts, you can also source any free-to-use images online, upload them to the Cricut Design Space and then cut them out! 4. SmartSet Dial: The smart dial eliminates to so much guess-work out of which setting for the pressure you need to use to match the thickness of your material you wish to cut. The smart dial makes cutting easy for even the beginners. Simply select the right setting and cut. 7. ZOOM ZOOM – Super Fast Cutting: The Explore Air 2 is twice as fast as its predecessor. That is a MAJOR improvement and brings this machine up to scratch with more expensive and more professional cutting machines. Fast cutting means you have more time to create! 8. Draw and Cut Feature: Another time-saving feature is the ability to be able to draw and then cut out your design in one smart process. 9. Print and Cut feature: Another feature which just proves how versatile this machine truly is, is the ability to print your image from your printer and then pop it on your mat for the machine to cut out. Easy-peasy. 10. You can Design from your Computer, Laptop, Tablet or iPhone: Not in the mood to design with your heavy laptop? No problem, grab your iPhone and design away. Because the software is cloud-based, it will even sync across all your devices. You can design offline as well, which is great news for those who struggle with connectivity. 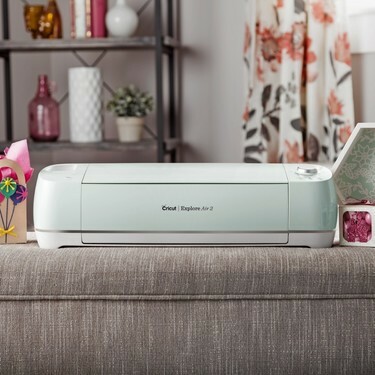 The Cricut Explore Air 2 is a fabulous machine and it has an incredibly awesome price tag on it when compared to similar machines from other brands. If you haven’t done so yet, you might like to read our in-depth Cricut Explore Air 2 Review, see how this machine compares to other machines that cut vinyl. 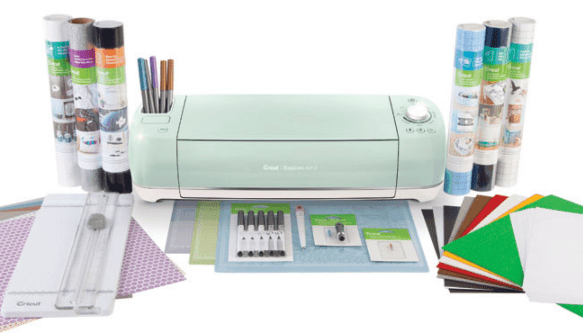 If you are convinced that this is the machine for you, we highly recommend you save some money by grabbing a Cricut Explore Air 2 bundle. If you have any other questions about this machine, please leave them in the comments below. Click here to hop over to our Cricut machine hub where you will find all our Cricut articles, reviews and project posts.